In these financially difficult times all sorts of questions arise about money. What is the value of different currencies? How safe is it to invest in gold versus currencies? How do money and debt influence our daily lives? 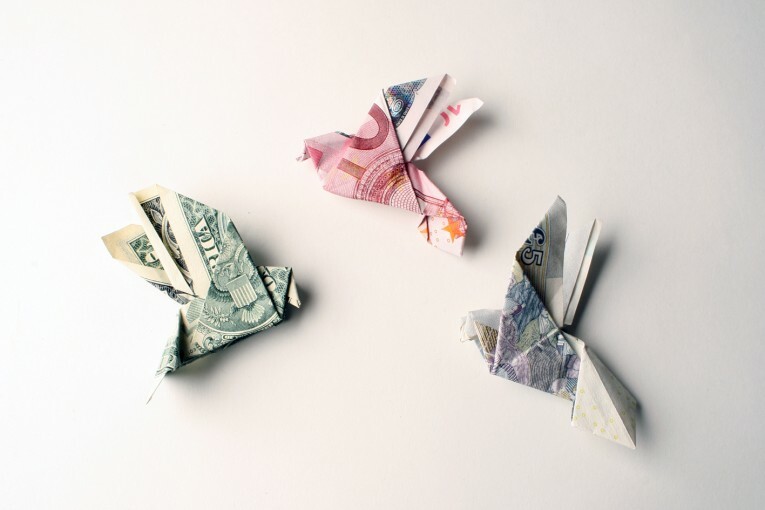 Tine De Ruysser does not want to become a financial expert, but to find out more about our human approach to money, what we do with it, and how we feel about it. 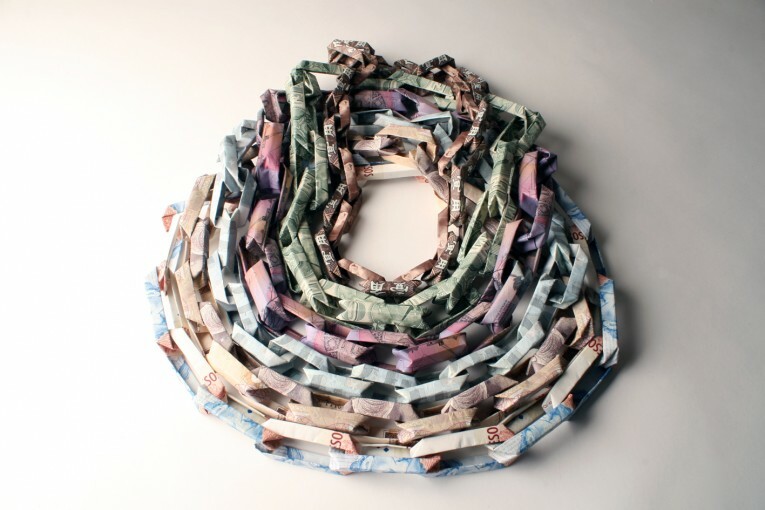 A jewellery collection made wholly from banknotes. 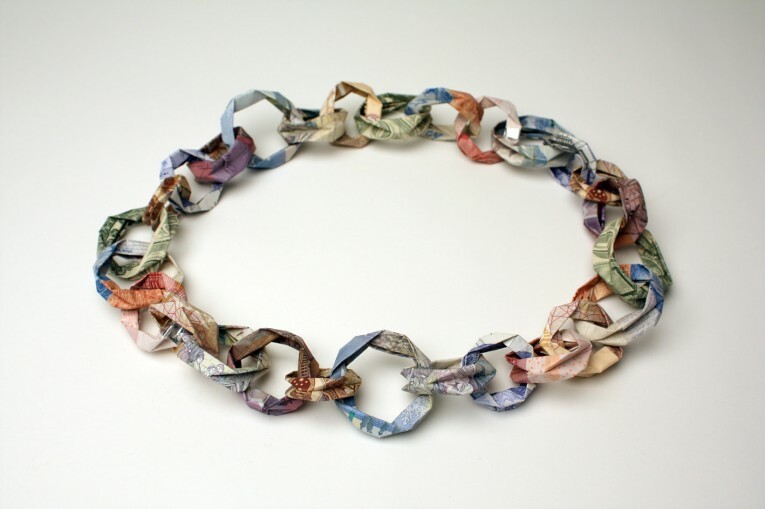 All banknotes are valid currency at the time the jewellery is made. 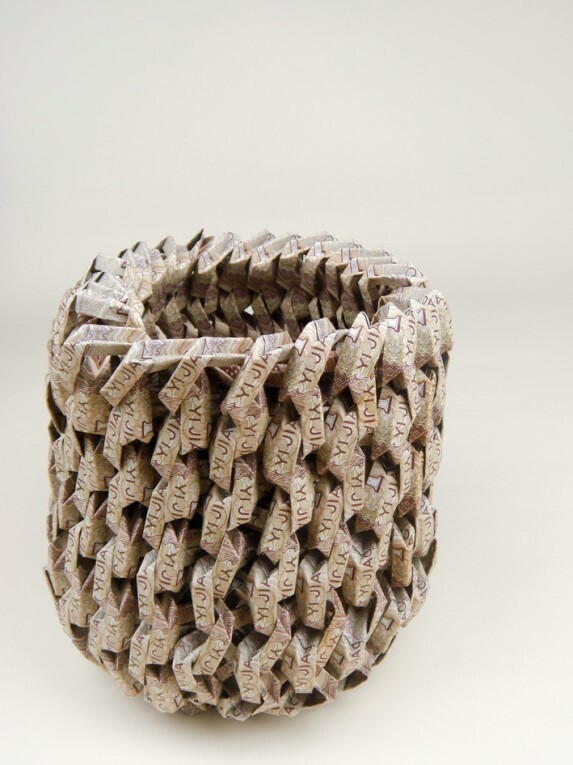 The banknotes are only folded and not damaged in any way: no cutting is used, nor is any glue applied. 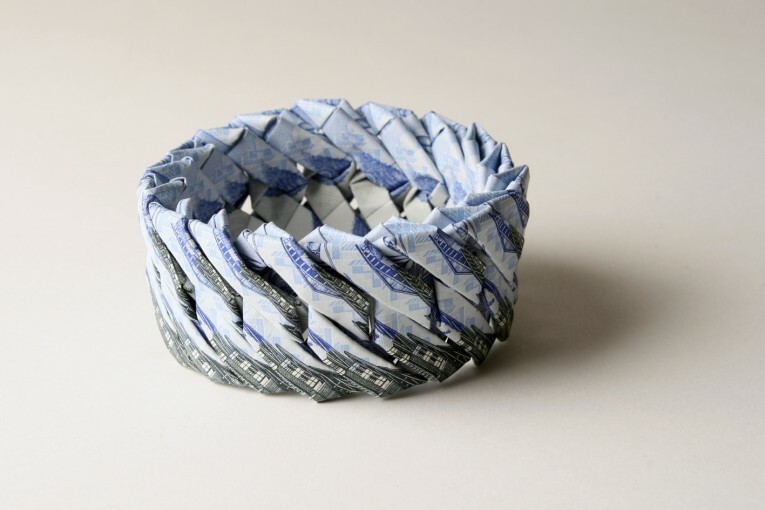 Each note can be unfolded and used as currency. The jewellery is surprisingly strong; it does not tear easily or fall apart quickly. Some countries (like Australia) use polymers (plastics) rather than paper to make their bank notes; in that case the jewellery is even waterproof. But in the end the pieces are just origami. They do need to be handled with care. 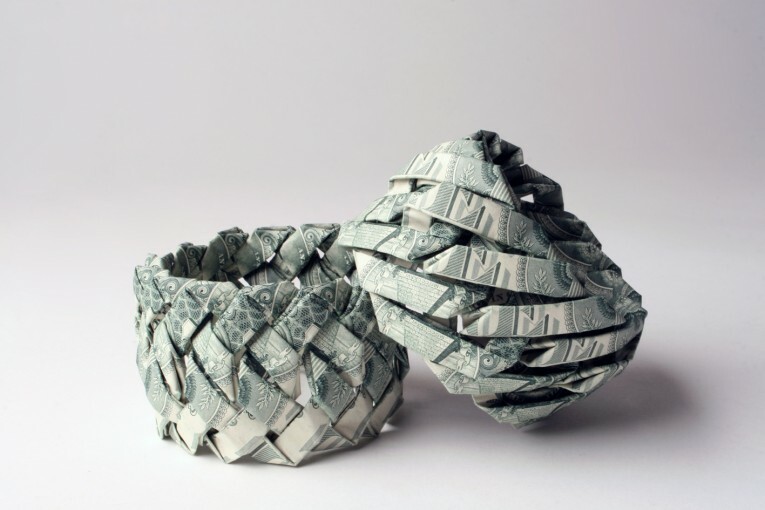 For this collection Tine De Ruysser considered money to be like gold. After all, paper money came into existence because people did not want to carry their gold around when travelling, mostly for safety reasons. When “paper money” was first used it was backed up by a gold reserve: there was no more money printed then there was gold in the bank. Money was worth gold. 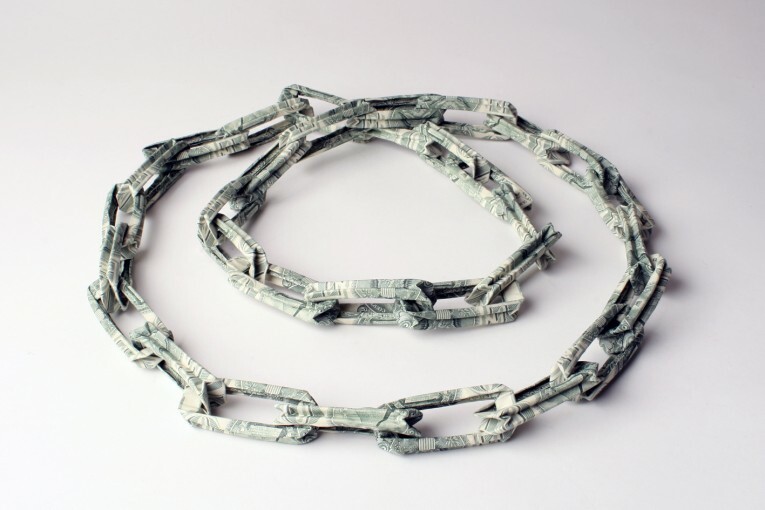 Through time the connection between money and gold has become less transparent. The relationship has almost turned around: now gold is worth money. There is much more money around than there is gold to back up its value. Gold jewellery can be worn to show how wealthy the wearer is, or as an easy way to keep one’s worldly possessions within reach at all times. 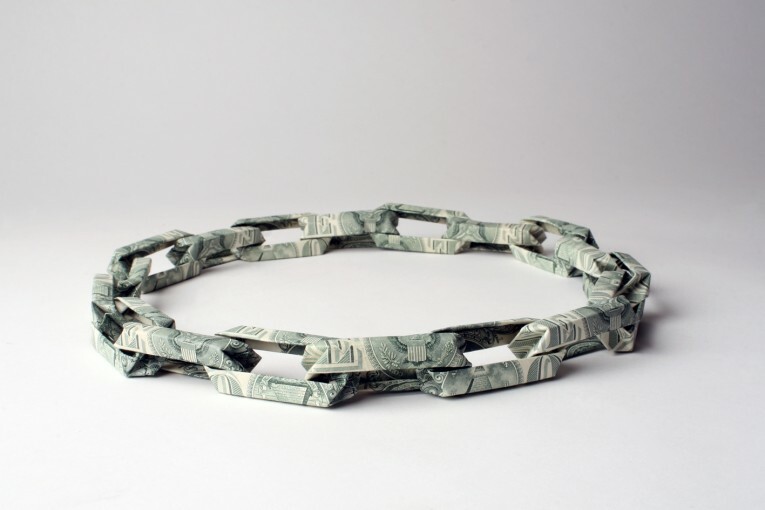 Similarly, wearing money around one’s neck shows one’s wealth. Even though the banknotes are folded so one can never see the whole note, they are still clearly recognisable as money. It is hard or impossible to see the value of the notes though, like it is difficult to judge what carat gold was used for a piece of jewellery. In both cases different colours can be chosen. When the wearer is in financial difficulty, gold jewellery can easily be sold, exchanged for money. 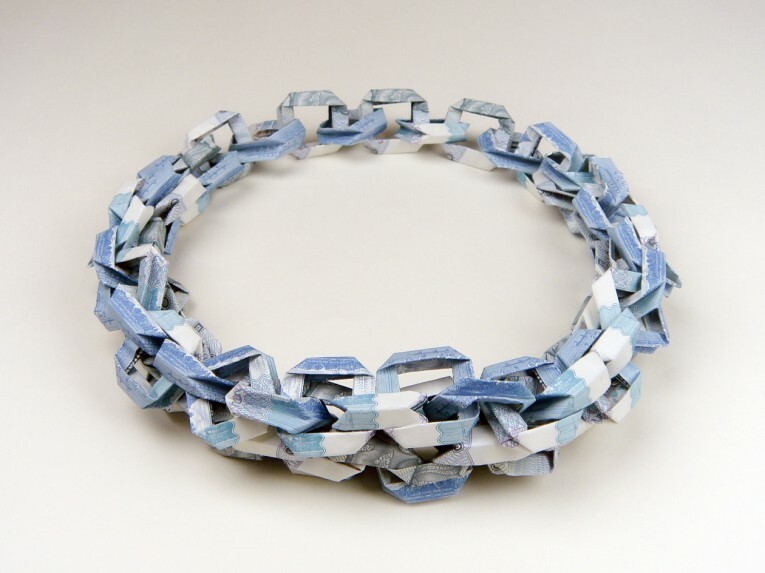 Money jewellery can easily be dismantled into its component banknotes. Both for gold jewellery and for money jewellery you pay more than the pure value of the materials when you buy the jewellery because the jewellery maker and gallery owner have to make a living from their work. The value of gold changes on a daily basis, it depends on supply and demand and the stock market. Likewise, money changes value when compared to other currencies and gold on a daily basis. 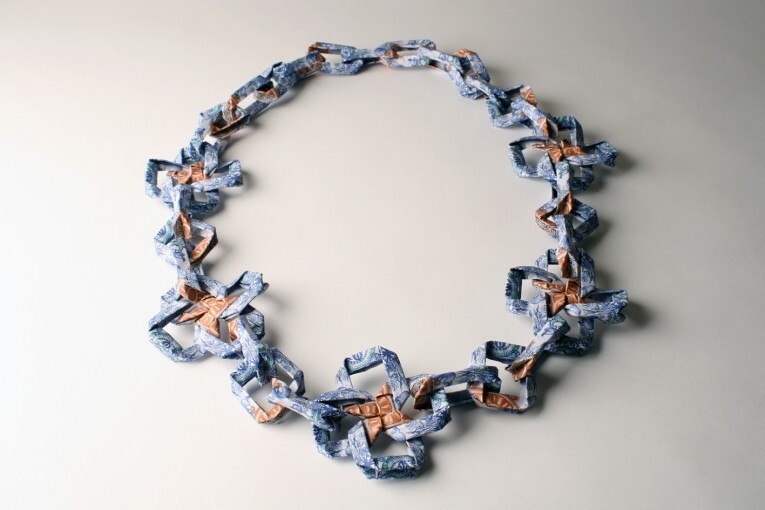 When the designer makes jewellery from valid banknotes, it is like making gold jewellery: everyone can see that the jewellery is worth money. The jewellery is pretty, and comes in a variety of shapes, sizes and colours. The price changes accordingly. The whole gold-money concept seems to be given some extra depth in the light of the current economic crisis. Banks have gone bankrupt because they were dealing in virtual money that had little to do with gold values backing it up, or even with the amount of paper money in circulation at the time. They are not to be trusted by savers or lenders. Why not go back to traditional values, and wear your wealth on your body so you don’t lose it? 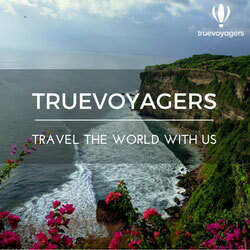 With exchange rates changing fast this is as much of a gamble as wearing gold or putting your money in the bank. Tine is a jewellery designer by training. Her first degree at the Royal Academy of Fine Art in Antwerp taught her jewellery techniques, there she also learned how to design conceptual work. She then went on to the Royal College of Art in London where she finished her MA in 2001. During her two years there, she invented an innovative folding material: a combination of metal and textiles. After finishing her MA, Tine returned to Belgium where she set up as a freelance artist-designer of jewellery and accessories. She trained as a teacher, and briefly taught at the “Stedelijke Academie voor Schone Kunsten” in Sint Niklaas in 2005. Later that year she started a PhD at the Royal College of Art. Her research was a further development of the material she invented during her MA. 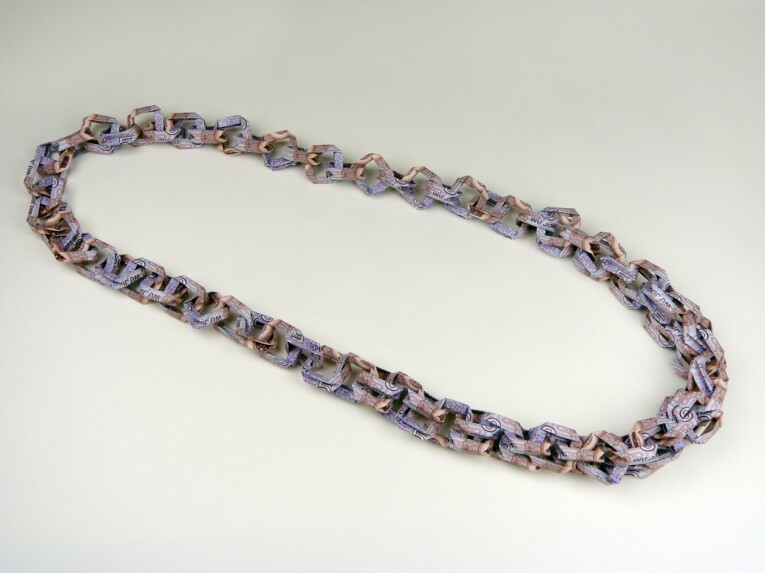 She investigated production methods and folding patterns as well as the design possibilities for wearables (jewellery, accessories and jewellery-fashion hybrids). In 2010 Tine finished her PhD, officially making her a doctor in the subject. 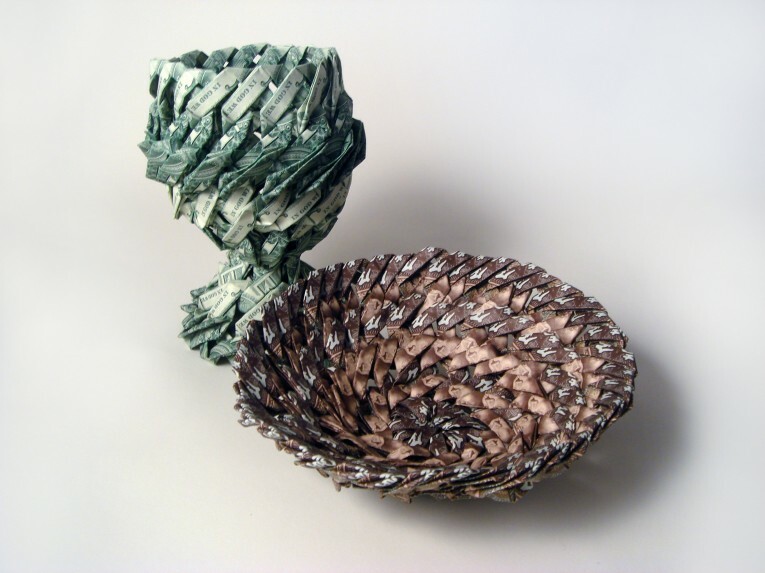 Tine enjoys making work in those two different ways: either reacting conceptually to a brief, or creating flexible folding objects as beautifully as possible. Tine loves sharing knowledge with people of all ages, and aims to find a teaching position now she has finished her PhD.